Tuesday is the start of school in Fairfax County so motorists need to be especially careful during morning and evening rush hour. We've seen an increase in kids biking to school in Fairfax, and often the most dangerous place to bike is around the school where walkers, bikers, school buses, and parents driving kids to school all converge. See Back to School Safety Reminders from Fairfax County Police. Fairfax County Police urge motorists to be extra vigilant for pedestrians and bicyclists as county schools resume classes Tuesday, September 2. Commuters should expect increased congestion throughout the week and build time into their schedules to accommodate for the traditionally heavy time period. Residents may also notice police officers posted in school zones and near bus stops helping ensure pedestrian safety as well as safe loading and unloading of students. We live near the Wiehle-Reston East Metro station and ride by the station most days. We've been stopping by the three bike parking locations at the station and counting bikes since the station opened, usually around 10am. There are 10 U racks at the south station entrance, with a capacity of 20 bikes. On the north side there are 16 U racks outside the bike room that hold 32 bikes. Those racks are free and under cover. And then there is the secure bike room that can hold over 200 bikes. Over time the number of bikes has gradually increased from a low of 61 on the second count to a high today of 107. 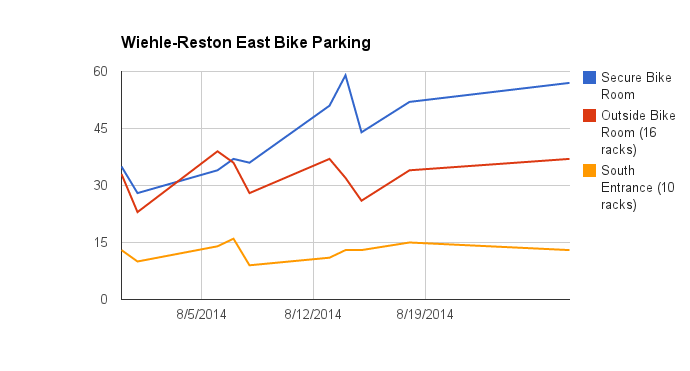 If you compare the high number with the 2013 Metrorail bike parking census conducted by WMATA, the Wiehle station would rank 3rd in the category "Top Stations for Total Bikes Parked". The free bike room racks were over capacity 6 of the 10 days, at capacity 1 day, and under capacity 3 days. The south racks usually were in the 12-14 bike range (of 20 capacity), so there was usually place to park there. The bike room was at about 1/4 capacity with plenty of room for more bikes. While it's great that people are using the existing racks and there is plenty of capacity in the bike room, the free bike parking at the Wiehle station needs to be expanded soon, especially on the north side nearest the W&OD Trail. We think many commuters are using the W&OD Trail to reach the station, many going to/from the Reston Town Center and other locations on the north side of the station. Ultimately there will be bike racks on the plaza outside the station entrance; those racks should be installed as soon as possible. Information about the bike parking is located in several places online. If you visit the WMATA Wiehle-Reston East station page there are 10 lockers listed. Those are located on the south side of the station, next to the 10 U racks that are not listed. The bike parking on the north side is not listed either. If you visit the Silverline Metro Wiehle-Reston East page it incorrectly lists 15 racks on both the north and south sides. It also lists the 200 spaces in the bike room. To rent the lockers you need to contact WMATA. To rent space in the bike room you need to contact Fairfax DOT. We were contacted recently by someone who tried to park their bike in the free racks outside the bike room but the racks were full. He checked the WMATA Bikes & Metro leaflet and there was no contact info about the bike room. He asked staff at the station but they didn't know how the system worked. Metro police told him to call the WMATA bike locker number, 202 962 1116, but they don't control the bike room. Not wanting to lock his bike to the fencing around the racks he gave up. There is a sign next to the bike room that lists the Fairfax County DOT phone number (Information and Lost & Found, 703-877-5600). There is also a sign on the door to the bike room with the county logo with the text County of Fairfax Virginia, Wiehle-Reston East Bike & Ride, not to be confused with WMATA's Bike & Ride, a completely different system. People don't care who controls what at the stations; they just need clear information about how to use the facilities. Ideally there would be one point of contact for all bike facilities at the stations, but that will likely not happen for a while. After September 11, 2001, Woodlawn Road through Ft. Belvoir, from Route 1 to Telegraph Road, was closed. Woodlawn Road was part of U.S. Bike Route 1 through Northern Virginia. Cyclists were forced to find an alternative route, which ended up being a dangerous, long stretch of Route 1. The new road, Jeff Todd Way/Mulligan Road, is a much needed alternative to Woodlawn Road. Del. Scott Surovell recently filmed a bike ride on the road just before it was opened. It was my understanding that the outside lanes would be 14 feet wide but it's difficult to tell from the video. There is a wide shared use path on the west/south side of the road that was expected to be completed by the time the road opened on August 25. For more information on the road see the Federal Highway Administration site and the VDOT site. The new road connects to Telegraph Road that is being widened and will include bike facilities, either bike lanes or a multi-use trail. We were contacted by a cyclist who once tried to ride a long, 75-mile loop "from Herndon, down the W & OD to the Custis, along Mt. Vernon Trail to Mt. 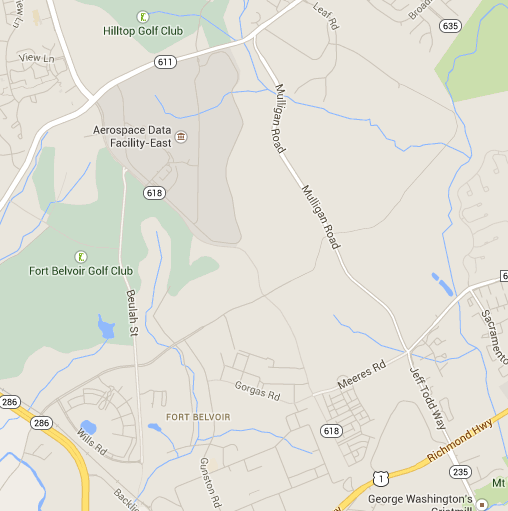 Vernon, then attempted to 'link' over to West Ox and the Parkway Trail back up to Herndon." He was not able to find a bike-friendly connection over to West Ox Road. When the Telegraph Road widening is completed, the long loop he mentioned should work. A cyclist could ride from Mt Vernon Trail along Mt Vernon Memorial Hwy to Jeff Todd Way at Route 1, north to Telegraph Rd, west to Beulah Rd where there are bike lanes leading north to a trail parallel to Franconia Springfield Pkwy where they could head west to the ped/bike crossing of I-95 and continue west to the Fairfax Co Parkway. 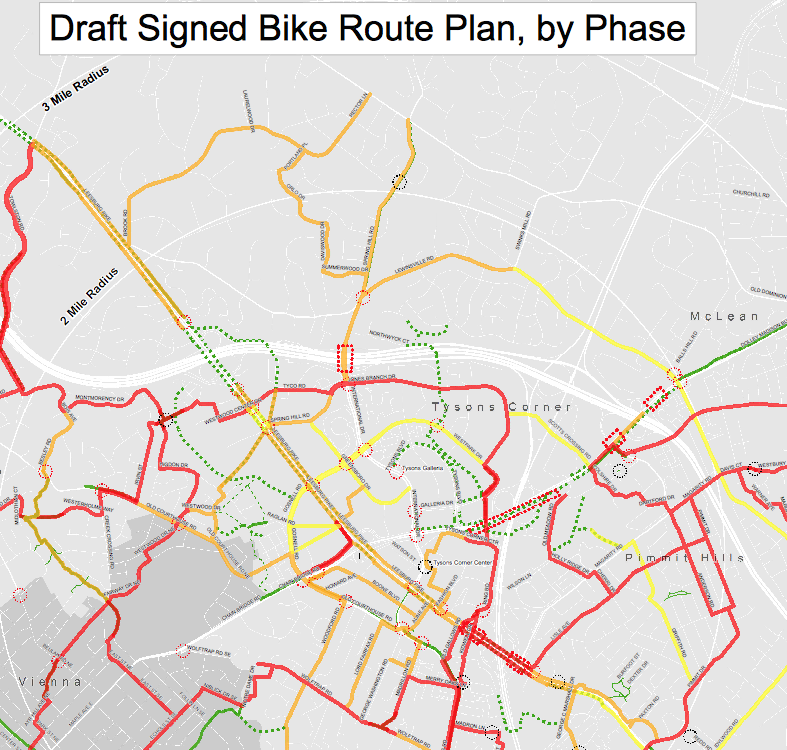 The Fairfax County bike map now needs to be updated to include the new road and trail. Here is Del. Surovell's video of his bike ride. VDOT is completing the installation of bike lanes on Sherwood Hall Lane as part of a repaving/pavement marking project to improve safety. See an earlier FABB blog post for details. We've already heard from cyclists in that area who welcome the new bike lanes. Thanks to Supervisor Hyland and Delegate Surovell for supporting the project and to Fairfax County and VDOT staff for their work on the project. The newly configured road will benefit all users by making it safer and providing a dedicated bike facility. Please send thank you notes to Supervisor Hyland and Del. Surovell. Multimodal improvements are critical to get more cars off the road. It is also hoped that by restricting lane size, this will help to lower speeds and illegal passing on Sherwood Hall Lane which has become a real problem with increased cut through traffic. These improvements were the result of two public hearings and significant public input. These lanes will eventually link into to a multiuse path on U.S. 1 and other bike lanes as U.S. 1 is redone, properties are redeveloped and road repaved. Lucinda Shannon works downtown and lives two miles from the Wiehle-Reston East Metro station. Like many Reston residents, she started bike commuting when the station opened. Kelley, of FABB and the Reston ped bike committee, volunteered to help her find a good bike route and gave her some moral support. See Lucinda's story in the Post article, Meet the Silver Liners! We tagged along with a few new riders to see how it's going. As soon as Shannon realized her house was just two miles from the Wiehle-Reston East Metro station, she decided to become a bike commuter. She could pedal to the Metro, and then ride downtown to her job with Easter Seals. Her first step was obvious: Buy a bike. But how would she lug her stuff? Or ride with traffic? Or figure out what to wear? Enter Kelley Westenhoff, chair of Reston’s Pedestrian & Bicycling Advisory Committee. Her group developed 10 route maps for residents looking to get from their neighborhoods to the new station. Committee members even offered to create individualized plans, meet people at their homes and lead them on a commute. The Ashgrove Trail is a major entry point into Tysons near the Spring Hill Metro station. 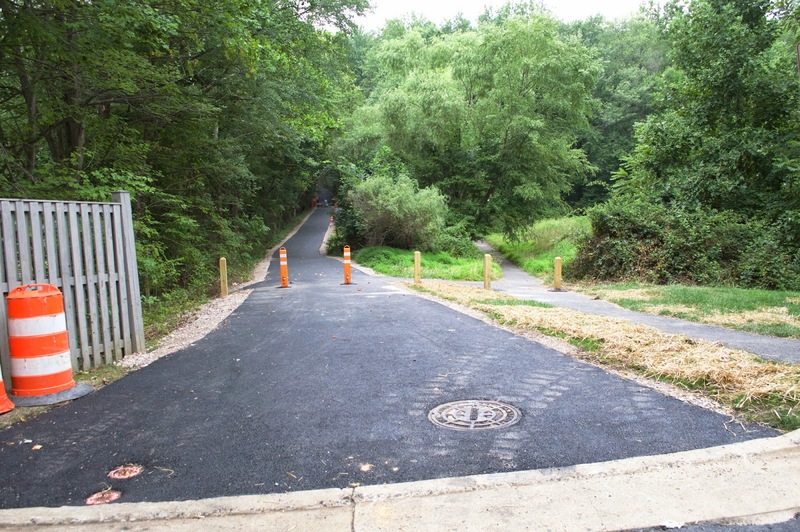 Fairfax County Park Authority recently completed major repairs to the trail and bridge. They also removed a barrier at one end and replaced it with bollards. The trail is now very smooth and in excellent condition. The only remaining work is installation of a guardrail along sections of the trail. Thanks to the Park Authority for maintaining this important trail connection and making the needed repairs. The trail is the former roadbed of Ashgrove Lane. It connects the residential communities along Old Courthouse Road with Tysons. It is also an entry point from the W&OD Trail. There was an electronically controlled gate on the Tysons end of the road that was for the exclusive use of a couple living nearby based on a earlier agreement. The easement ended once that couple passed away. a hazard to trail users. prevent motorists from using the old roadbed. There is still a stub of a bollard on the trail from Montmorency Dr that needs to either be removed or repaired. Cyclists often use curb cuts/ramps where trails intersect roads. Occasionally cyclists ride on the sidewalk which is very difficult without a curb cut. 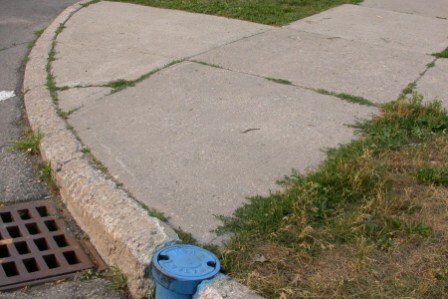 We all likely know locations where a curb cut is needed. The VDOT Curb Cut Survey is a chance for residents to identify missing curb cuts or curb cuts needing repairs. Example of a poorly constructed and maintained curb cut. 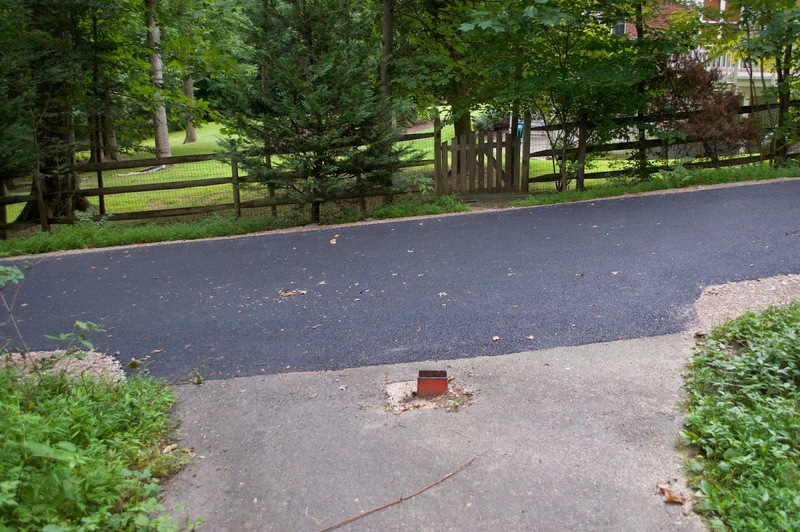 In collaboration with the Virginia Department for Aging and Rehabilitative Services, VDOT is conducting a survey of non-compliant ADA curb-cuts, locations where curb-cuts need to be installed or locations that are damaged and need to be fixed. 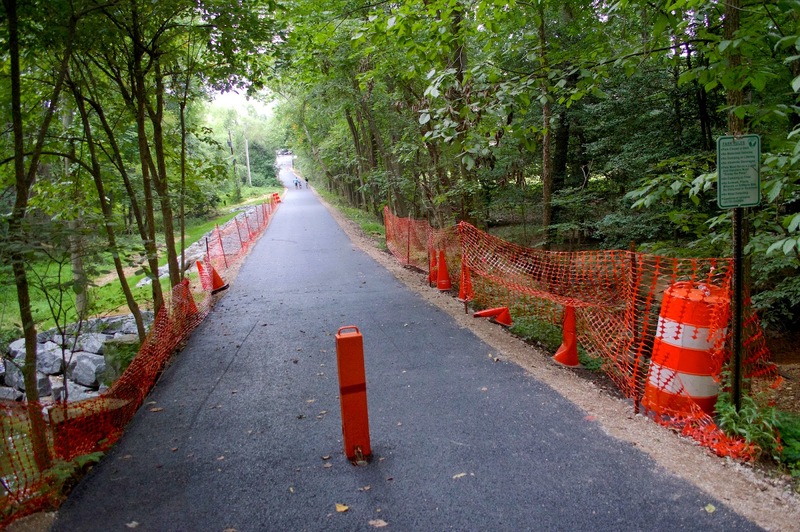 VDOT wants to ensure compliance with the Americans with Disabilities Act and needs your assistance to set priorities for both fixing problem areas and building new/additional curb-cuts. VDOT will concentrate, first, on the urbanized areas of Tidewater, Richmond and Northern Virginia. If you live in one of these areas, please assist us by identifying the issues and answering the following questions. *Please note that some locations may be the responsibility of a City or County government instead of VDOT. If this is the case, your comments will be forwarded to the appropriate jurisdiction. Fairfax County is looking for a replacement for the current bike coordinator, Charlie Strunk. Charlie will be leaving the county the end of this year. The position is located in the Department of Transportation and pays $64,254 - $107,090 annually. The closing date for applications is September 5. This Coordinator works in the Capital Projects and Operations Division and is directly responsible for managing and overseeing the county's comprehensive bicycle program, including both capital and non-capital program areas and projects. Serves as the senior technical resource on all Fairfax County bicycle issues, and supervises one Transportation Planner II. Position responsibilities include: Coordinates with other staff, agencies, and departments involved in bicycle planning, design, and construction including both public and private sectors. Develops policies and procedures to enhance and support bicycling as part of the county's multi-modal transportation policy and complete streets efforts. Responsible for bicycle project development including coordinating and reviewing projects assigned to others. Reviews development applications and plans including rezoning applications, special exceptions/special permits, and site plans assuring that bicycle issues are addressed. Coordinates with the Virginia Department of Transportation regarding state transportation improvement projects assuring bicycle issues are addressed. Manages the county's growing bicycle parking infrastructure program including the bicycle locker rental program and the new network of secure, enclosed bicycle storage rooms Assists with identifying and securing funding for both capital and non-capital bicycle projects. Responsible for developing and prioritizing bicycle projects to be added to the county's transportation improvement program. Works with elected officials, agency representatives, design consultants, bicycle advocacy groups, and the general public on all county bicycle-related issues. This position will require attendance and participation at public meetings, public hearings, and workshops, as well as both local and regional bicycling events. We'll write more later about Charlie's many accomplishments as bike coordinator. Virginia now has significant funds for transportation projects. In order to receive funding, projects must be included in long range transportation plans. VTrans 2040 is the "long-range, statewide multimodal policy plan that lays out overarching Vision and Goals for transportation in the Commonwealth." Cyclists are encouraged to provide input into the next long range transportation plan by filling out the short VTrans2040 Vision Survey that takes about 10 minutes. By taking the survey you have a chance to win a $100 gift card! Fairfax County recently released a new tool to allow residents "show us where you think pedestrian safety can be improved. This tool is an extension of our existing process that allows residents to e-mail FCDOT and request sidewalk and trail connections, curb ramps, improved signage, and other strategies to improve pedestrian safety." This is a great tool, showing current projects and allowing residents to relatively easily request new facilities. However, bicycle safety requests need to be incorporated into the application. One of the options is to use an interactive map to draw the location of a new trail connection. By turning on the map layer showing existing pedestrian projects, you can see if a project is already underway at a particular location. Projects requested by others will also be displayed. The image above shows the planned Vesper trail leading to the Spring Hill Metro station (shown as a dashed blue line). Also shown are planned paved bike shoulders on Old Courthouse Road (also a dashed blue line at Freedom Hill Park). 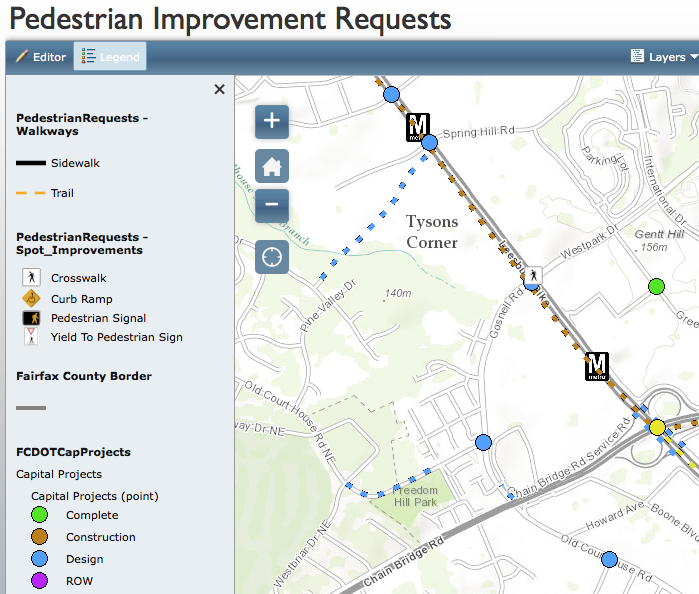 See the Pedestrian Infrastructure Requests page to view instructions on adding a feature, and a link to the interactive map. We plan to ask county staff to modify the tool to include bicycle safety improvements. It would be relatively easy to add the ability to indicate where sharrows, bike lanes, paved shoulders, cycle tracks, climbing lanes, and other on-road bike facilities are needed. This weekend VDOT plans to change the timing of the traffic signal that controls the W&OD Trail crossing of Gallows Road. Cyclists have complained for years about the long wait times at this signal. VDOT is responding to those complaints and will reduce the cycle by half, from 150 seconds (2.5 minutes) to 75 seconds (1.25 minutes). Trail users must press the pedestrian signal button to ensure the signal changes. Thanks VDOT! VDOT studied this crossing recently to investigate possible improvements that could be implemented when the signal equipment at the crossing is replaced. One of the study’s suggestions was to improve the signal timing, which can cause long waits for trail users. This suggestion does not require new signal equipment. As such, tomorrow (August 9), VDOT plans to try using a shorter signal cycle length during the midday on weekends. Previously the signal operated with a cycle length (time between successive WALK indications) of 150 seconds during the weekend midday period. Starting tomorrow the cycle length will be shortened to 75 seconds. The trail signal is the only one we are adjusting. Other signals along the Gallows corridor will continue to operate with a 150-second cycle. Not all trail users wait for the full cycle length to cross, because they arrive randomly during the course of the signal cycle. Previously the average trail user wait time was 69 seconds, and with tomorrow’s change the average wait time will drop to 33 seconds. We are starting implementation during the midday weekend period because trail use is heavy at this time and our review shows that traffic on Gallows will operate well (although perhaps not quite as well as before) with the shorter cycle length. The midday weekend period is in effect from 10:30 a.m. to 6:30 p.m. on Saturdays and 10:30 a.m. to 6:00 p.m. on Sundays. In the hours before and after these times, the signal operates with a cycle length shorter than 150 seconds. Our intention is to observe traffic and trail user conditions during the midday weekend before making a decision about whether to extend this same treatment to other times during the week. Feel free to let us know if you hear feedback or comments about this change. Also note that if we observe any unforeseen problems we may revert back to the original timing on short notice. Fairfax County Police are conducting a very short Neighborhood Speeding Survey. Do you see people speeding in your neighborhood? Do you wish police stopped more people for speeding? The survey is a good way to let police know what you think. On those occasions when I drive, I obey the speed limit, literally. I don't believe that because I can go 5-10 mph over the speed limit, that it's the right thing to do. I'm in the minority because almost everyone on the road seems to go faster than the speed limit, some much faster. 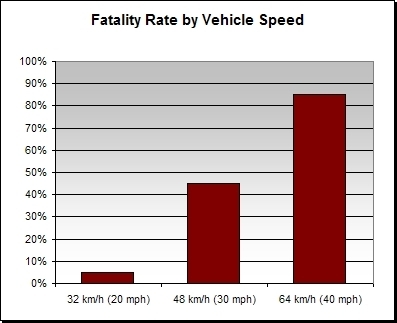 This graphic shows the importance of speed on pedestrian, and you can assume bicycle, crashes. At 20mph the pedestrian fatality rate is around 5%. At 40 mph it's around 85%. Speed kills. Today is a Code Green day. What does that mean? Clean Air Partners recently released a new infographic on air quality that includes explanations of the various air quality ratings. We've been fortunate that we've had a relatively mild summer without many Code Orange or Red days. Code Green indicates that air quality is good, and we can keep it that way by biking, walking, and taking transit. Clean Air Partners also provides a handy Forecast Widget that displays the current air quality rating and contains a tab for displaying the three day forecast. We've embedded the widget on the FABB home page. The county has a good list of projects in Tysons and Reston to facilitate ped/bike access to the new stations, but they needed to be in place by now. Extra resources should be devoted to completing those projects as soon as possible. Fairfax County transportation officials acknowledge that there is more work to be done in making routes designed with cars in mind friendlier to people traveling on foot or on bike. During a study process in 2011, the county identified 39 pedestrian and bike projects needed to improve access to the four Tysons stations. About one third of those projects have been completed so far, Biesiadny said, and the Board of Supervisors has identified funding for all of them. However, it may be several years before they are all complete. Bruce Wright, president of Fairfax Advocates for Better Bicycling, said he understands that it will take some time for the county to get projects done, but he believes there are some low-cost fixes that can be used in the interim to improve safety for cyclists. For example, he said, the county could paint “sharrows” on certain key roads — a chevron with a bike symbol that indicates that bikes will be sharing the road — or install signs that state that cyclists have the right to use the full lane. Without some additional awareness on the part of drivers, Wright said, people are hesitant to bike on roads like Westpark Drive and Gosnell Road that connect Tysons to big residential areas because they get harassed by drivers or feel unsafe. “If Gosnell and Westpark were more bike-friendly, then I think a lot more people would bike,” Wright said. On a positive note, Wright said there has been significant bike traffic to the Wiehle-Reston East station in Tysons, where much of the free bike parking as well as the secure 200-space indoor bike room inside the parking garage is seeing regular use. Direction: Rte. 286 N/B Fairfax County Parkway Trail. Where: From Rte. 7 exit ramps to Lake Newport. And at the intersections of Tuckaway Drive and Stringfellow Road. When: Tuesday 8/5/14 and Wednesday 8/6/14 from 8:00 AM to 4:00 PM. The opening of the Silver Line has highlighted challenges for pedestrians and bicyclists in Tysons and to a lesser extent, in Reston. Yesterday we worked with Coalition for Smarter Growth on a news release on the situation: Opening of Silver Line Prompts Public Attention to Safety Issues for Pedestrians and Bicyclists. With the opening of the first phase of the Silver Line, news stories and social media are drawing attention to the unsafe conditions for pedestrians and bicyclists on many of the roadways surrounding the stations. While the number of people parking at the new Silver Line stations is much lower than expected, the number of bicyclists has been surprisingly high, with bike racks at the Wiehle-Reston East station filling up quickly, and cyclists voicing the need for more bike lanes to safely reach the stations. Writing Wednesday on Greater Greater Washington, Ken Archer (Chief Technology Officer for a company in Tysons), described the difficult situation pedestrians face in trying to cross as many as nine lanes of traffic at the intersection of Tysons Boulevard and Galleria Drive, where two sides of the intersection are missing marked crosswalks. Wright offered a number of other recommendations, including adoption of the Tysons Bike Plan, expediting specific projects like the Vesper Trail and Old Courthouse Road bike facilities, a near term and interim measure to paint “sharrows” on Tysons roads to alert drivers to the presence of bicyclists, wayfinding signs for bike routes, more bike lockers and racks, and strengthened coordination between the County, VDOT, the Tysons Partnership (which can serve as a future Transportation Management Association for Tyson), Fairfax Advocates for Better Bicycling (FABB), local employers, and existing bicycle commuters. David Alpert of Greater Greater Washington followed up on the news release in his post Why is Tysons walkability and bikeability so bad? The south side of Tysons Boulevard and Galleria Drive. Virginia officials have known for years that Metro was coming to Tysons. Yet when the four stations opened, commuters found dreadful and dangerous walking and biking conditions. Why? The Fairfax County DOT has been making some progress. There are two crosswalks at the intersection of Route 123 and Tysons Boulevard, which FCDOT recently installed. But at the opposite corner, there are no crosswalks. This is where Ken Archer described pedestrians running across nine lanes of traffic without any crosswalk. Fairfax County is making progress, with several funded pedestrian and bicycle projects in Tysons that will provide better access. Those projects need to be expedited. As we noted above, short term recommendations in the Tysons Bicycle Master Plan, that was completed in 2011, should have been implemented last year. They include low cost features such as Sharrows, Bicycles may Use Full Lane signs, and wayfinding signage, all of which could be installed tomorrow.